It finally happened! A press release from PLOS landed in my inbox with the words “Language Evolution” in the title! What? Phylogenetic models applied to linguistic data to make inferences about human migration into and out of North America. Why? Hypothesis testing/model fitting an Out-of-Beringia (to Asia) hypothesis compared to an Out-of-Central Asia (to North America) hypothesis. Results? The Out-of-Beringia model fits better (the results section is massive, you should go and read it if you’re interested in the details). 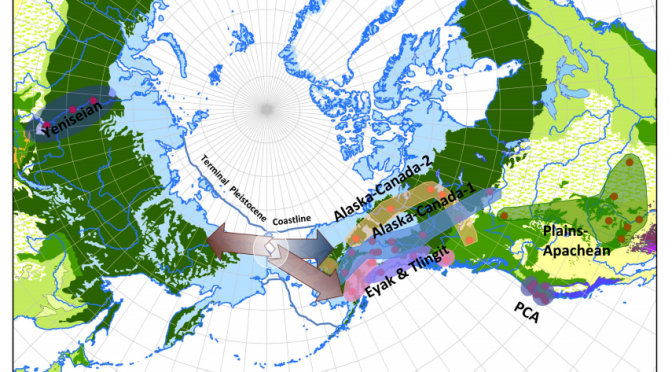 This model supports the story that there was a back-migration into Asia from Beringia, which is in contrast to recent arguments that the connections between Na-Dene languages and Yeniseian languages show that the Native Americans migrated from Central Asia. This seems to be a reasonably solid piece of work, though I should leave it to someone else to assess the legitimacy of the statistical analysis/results. It’s nice to see also that the press release does state that: “the authors cannot conclusively determine the migration pattern just from these results, and state that this study does not necessarily contradict the popular tale of hunters entering the New World through Beringia, it at the very least indicates that migration may not have been a one-way trip.” Back-migration is rarely considered when testing hypotheses using models for serial-founder effects – and I think this must happen more than we often assume in linguistic phylogenies. In case anyone’s interested here is some of the news sources that covered this paper. I absolutely agree. I’m thinking of asia the same way.